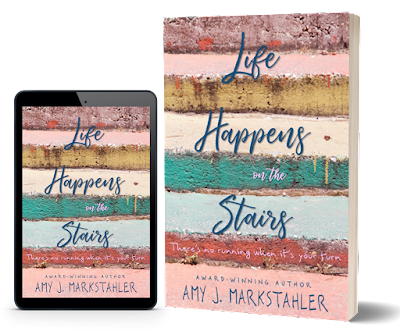 “Life happens on the stairs” by Amy Markstahler leads readers through a journey of heartbreak, unfair circumstance, strength, friendship, and unconditional love. The story flows and allows readers to escape into the life of Elsie, a young woman faced with every obstacle and accompanied by a gentleman strong and loyal enough to make any girl blush. The events that unfold throughout the book address issues commonly found throughout our day to day lives and other uncommon fates some can find harder to relate to, though this poses no problem. Author Amy Markstahler grips the reader and allows us to experience the book and relate as though its our own memories and experiences, one may find themselves on a rollercoaster of emotions. Characters, Elsie and Tyler fight the world with only love on their sides, over and over again it's only the others companionship that make life bearable, Will their love be strong enough to last or will families, fights, and rolling punches break them apart. This is not a book to be set down considering Author Amy Markstahler allows the reader to love the characters like their own and hate those that hurt them. “ Life Happens On The Stairs” is in every way a well written, smooth flowing story and a five star, grand work of Art. I'm so grateful for Sabrina's review! I'd love to know what you think, as well! Life Happens on the Stairs is available for pre-order now.